1. Life is NOT going to be easy. There are going to be lots of ups and downs. Some days you are going to need more chocolate than others to get by. Don’t be afraid on those days to indulge…it will help. You will make it through. 2. Oil is for cooking…not for lathering on your skin and baking in the sun. So skip the oil and use sunscreen instead. Someday you will wish you did. 3. Hug the people you love everyday…your time with them is precious. Enjoy them while you can and never ever go to sleep mad. 4. Stop smoking now. The damage is reversible. 5. Your body was made to move…you might not be athletic or even coordinated but you can still exercise. Be kind to your body and it will do things you never expected it could do. 6. Make wise choices. What you decide today will follow you through the rest of your life. And whatever you decide don’t have any regrets. Just know that at one time it was exactly what you wanted and move on. 8. Stop worrying about your weight and your age. You are so much more than a number. Neither of these numbers matter to anyone that really matters to you. 9. Stop dieting. Instead make an effort to eat healthier. Eat less processed foods and more fruits and vegetables now and you will see changes…guaranteed. 10. Eat cake...lots of it. And it doesn't always have to be chocolate. 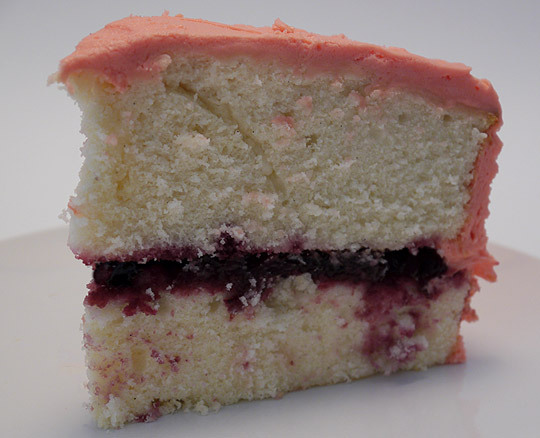 I know it's hard to believe but you will one day love this Cherry Vanilla Layer Cake. Preheat oven to 350 degrees F. Butter and line two 9" cake pans with parchment and butter parchment. Set aside. In a 2 cup glass measure, add the milk and heavy cream. In a medium bowl combine the egg whites, whole egg, 1/2 cup of milk mixture, vanilla beans and almond extract. Stir to combine. Set aside. Divide the batter and pour into the prepared pans. Bake for 30 minutes or until a cake tester comes out clean. Remove and cool on a wire rack for 10 minutes in the pan before turning out to cool completely. Place frozen cherries, sugar, cornstarch and lemon juice in a heavy-bottomed medium-sized pan. Heat on medium until cherries begin to release their liquid. Bring to a boil, stirring constantly. Reduce to a simmer and heat until cherry mixture has thickened. Allow to cool. aw what a sweet email:) thanks for sharing! and that cake look bomb!!! yum! Loved this! All so true! Happy Birthday! Really love this post. Number 2 hit home because we used to slather ourselves with oil and bake for hours as teens. Stopped that for good at 19. Hope I stopped early enough! Happy belated Birthday! Happy Birthday friend. I love each and ever one of your advice bullets. It's all so true. Life really is just a flash in the pan and everyday should be a celebration of life and love. I'm so glad you loved the cake. It's very scrumptious looking! I'm glad you jumped out of your comfort zone. Happy belated birthday! Great advice and great cake!